Your Guide To Specialty Shopping, Fun Events & Unique Experiences! Click Cover Image To Read The Current Issue! 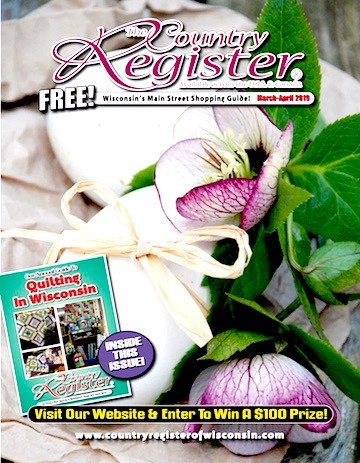 Every issue is full of stories and useful information for readers interested in the unique shopping possibilities and fun, new activities. The Country Register gives shop owners a place to promote, inform and even try out their writing skills if they so desire. The Country Register newspaper makes a handy 'carry it with you kind of guide'. It guides the reader according to areas of the state and within a city as well as putting special shows and events into their own section. © Country Register Of Wisconsin • It is a violation of federal copyright law to copy or duplicate any content, text or images from this website.